When I reached out to our friend Houston-based travel and food writer for Forbes Mai Pham for her recommendations for Mexico City, she got me on the line with Eduardo García, affectionately known locally as Lalo, one of the country’s rising celebrity chefs and owner of Maximo Bistrot Local. He’s currently in Rioja, Spain, but he swiftly connected me with Alejandra Soto, owner of a wonderful seafood restaurant in the city’s Zona Rosa called De Mar a Mar, where he consults on the menu. 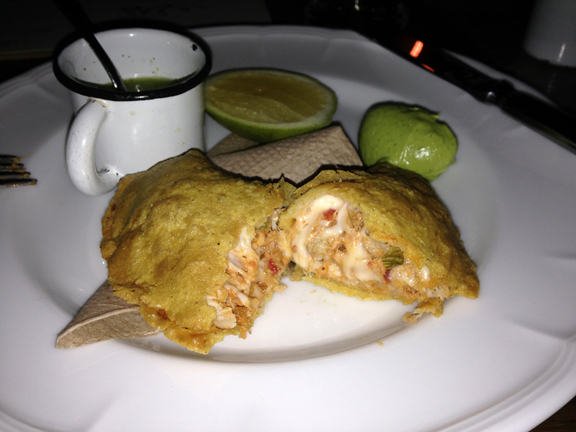 The dish de rigueur, he told me, was the quesadilla de pescado, the fish quesadilla (above). I split the quesadilla before photographing it to show the filling, btw. It was served with a tomatillo salsa, a dollop of creamy guacamole, and lemon wedge. What a fantastic dish! The creamy texture of cheese and the flakiness of the chunks of fish and they way they combined really took it over the top. 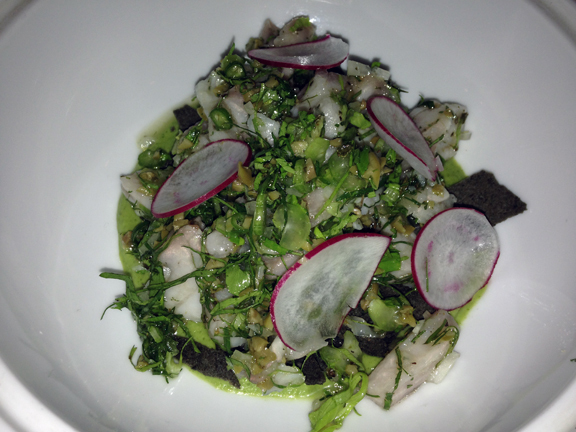 Even though I knew I had a lot more eating in store, I couldn’t resist the ceviche blanco. Alejandra’s chef uses oregano in this dish, an unusual but truly brilliant ingredient. I loved how it played against the cilantro. The other thing that I loved about the dish was that it was served over a thin spread of creamy guacamole. Again, it was the way the textures worked together that took the dish to another level. Another thing that impressed me about this restaurant was how knowledgable my server was in Mexican cookery. My Spanish is good enough to carry on a foodie conversation and as I peppered him with questions, I was rewarded by his insights into the regional origins and ingredient combinations in the platos he delivered at my table. And on a technical note, just to put this in perspective, my bill, with two beers (Bocanegra, clara) and a generous gratuity, was around $30 (American). My recommendation: RUN DON’T WALK.